The recharging process of batteries produces gassing as a result of the breakdown of oxygen and hydrogen gas. This is the primary factor that causes corrosion on your battery cables, terminals, and other battery related metal parts. During charging, the gas that escapes through the vent caps, bringing with it small particles of sulfuric acid which are heavier than air, drop and form corrosion on your battery cables, terminals, battery hold down rods, nuts and bolts. This acid settles on the top of your batteries and eventually makes its way down the sides of the batteries to your golf cart’s aluminum or steel battery tray. You will see a very corrosive white powdery substance on your battery terminals, cables and other metal parts in areas near your batteries. Corrosion probably will also be on your battery tray and on the garage floor. This corrosion can even travel inside your battery cables causing high resistance and improper charging. The corrosion that forms on your battery tray will eventually deteriorate the aluminum or steel battery supports and could cause your batteries to drop through the bottom of your cart. It is common to see the battery hold down rods, nuts and washers completely eaten away if corrosion is not managed properly and in a timely fashion. How does this happen? There are several reasons. 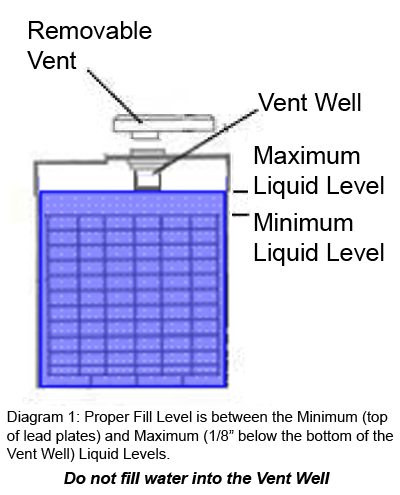 If the batteries are over filled or filled before they are charged, the electrolyte expansion forces some of the liquid out of the vent caps or past the vent cap gaskets on to the top of the batteries. Some batteries have vent caps that leak due to poor design. Trojan Battery Company has a proven and patented vent cap designed with a manifold that captures the condensation of the gas and then drains the liquid down the center of the cap back into the battery cells which practically eliminates all leakage and helps reduce water loss. As batteries age their voltage drops and require longer charging. During charging, these batteries get warmer and gas more, forcing the gas out of the cell vents or past the vent gaskets. In some cases where certain poorly designed single point battery fill systems have been installed, the fill system’s gaskets become distorted causing leakage or the watering system’s valves have failed to work properly causing leakage, under filling or over filling. Some golf carts have an on board computer which controls the battery charger. If the on board computer fails, it could allow the charger not to shut off, causing the batteries to overcharge, and gas (bubble) excessively and again cause corrosion. Proper water filling with distilled water is essential. Always fill your batteries after they are fully charged, not before. The correct water level should be no higher than 1/8 inch under the bottom of the vent well. “See illustration“. Do not fill the cells to a point where the water comes up into the vent well or “tube”. Also prevent under filling by keeping the battery plates covered at all times. Battery Boys provides you with a complimentary Battery Boys Dipstick after every battery installation to help you maintain proper battery water levels. Battery Boys also offers a “Lifetime Corrosion Preventative Package“. Single point battery watering systems, such as Trojan’s Hydrolink or Battery Watering Technologies Systems take all the guesswork out of filling your batteries and filling can be accomplished in less than a minute to a perfect level. We can install this watering system during your battery installation, at a later date or you can pick one up from our retail store.